What an idea…. put several different types of red chairs together for a dining room setting. Love this & could be done in any one colour! This purple door is dreamy, but with a little masking tape and two colours of paint you could create your own patterned front door. This is a great criss cross example. How about finding a place for a mint green arch? That could make a nice threshold… especially with this rustic vintage petite breakfast table. Do you think you could work with a smaller kitchen sink? How about two small circle sinks next to each other? I’m liking that! Lots of inspiration here! What’s your best source for inspiration? 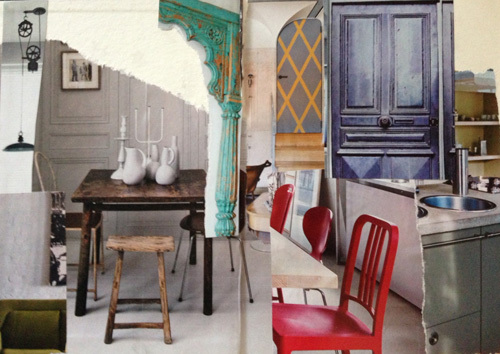 This entry was posted on December 3, 2013 by theguestroom in by JAR, Collage and tagged Best, Blog, Collage, Education, HK, Hong Kong, Journal, magazine, Top.